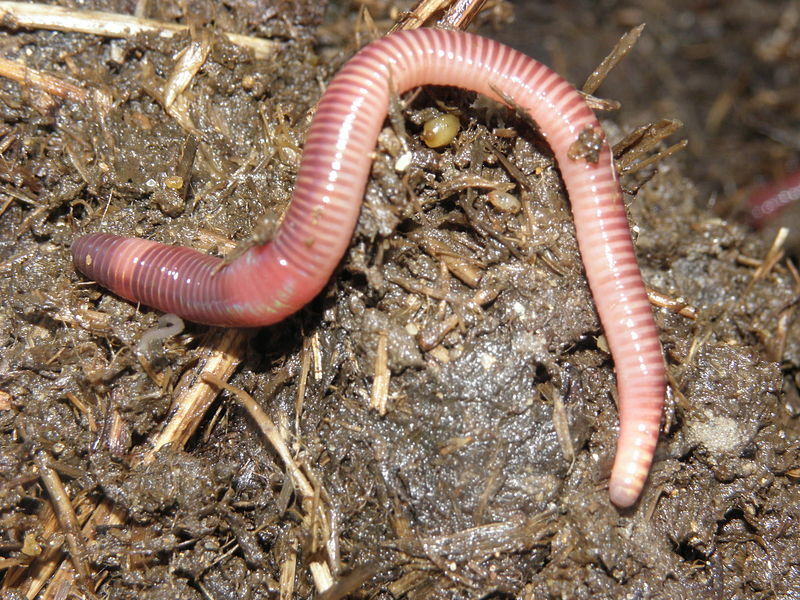 The main difference between earthworms and compost worms is that earthworms are burrowing, segmented worms that are important for aerating and draining the soil whereas compost worms are the red wiggler worms used in vermicomposting. Earthworms and compost worms are two species of segmented worms that can be used to improve the soil quality by breaking down organic waste. Furthermore, earthworms are reddish-brown in color and around ¼ to 6 inches long while compost worms are reddish-purple in color and around 2 to 3 inches long. Earthworms are a type of segmented worms that make up the class Oligochaeta. The main feature of earthworms is that they live and feed on the soil. Their digestive system runs through the whole length of their body and they can eat food weighing up to their body weight. Also, the main characteristic feature with their feeding habits is that earthworms are burrowers that bring their food deeper into the soil. That makes earthworms ill-suited to vermicomposting. In other words, they are generally found in the bottom of the compost bins and gardeners would have to turn compost continuously as they do not bring materials to the surface. Additionally, earthworms require moist environments as well. However, they perform an important function in aerating and draining soil as they make tunnels inside the soil. Compost worms are the red wiggler worms that are a species of earthworms. The scientific name for red wiggler worms is Eisenia fetida while the other names for red wiggler worms are redworm, brandling worm, panfish worm, trout worm, tiger worm, red Californian earthworm, etc. These worms are adapted to live in decaying organic material including rotting vegetation, compost, and manure. The main important feature which makes red wiggler worms the most suitable form of earthworms for vermicomposting is their surface-dwelling nature. That means that they bring organic material to the surface, reducing the requirement of continuous mixing of organic material. Additionally, their high rates of reproduction are also helpful in vermicomposting. Both species are two types of annelids belonging to the class Oligochaeta. They are tube-shaped, segmented worms. Also, both species live in the soil, feeding on dead, organic matter. And, they have a closed circulatory system and a coelom. Here, their coelom serves as a hydrostatic skeleton. Furthermore, they have a central nervous system, consisting of two ganglia and a peripheral nervous system. Additionally, both contain clitella, the large, lighter-colored bands that contain the worms’ reproductive organs. These are only prominent during the reproduction process. During the reproduction, two worms join their clitella. They are important in aerating and draining the soil. 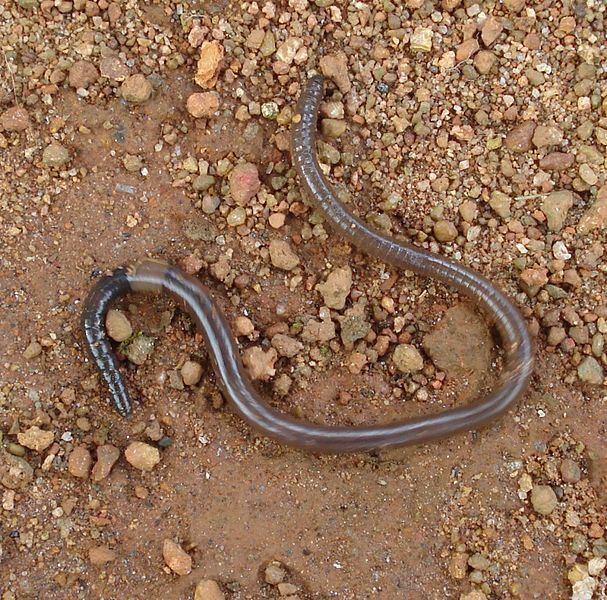 An earthworm is a burrowing annelid worm that lives in the soil, important in aerating and draining the soil and in burying organic matter while a compost worm is a red earthworm used in composting food scraps and other organic material and as fishing baits. Thus, this is the main difference between earthworms and compost worms. More importantly, an earthworm is a type of segmented worm while compost worm is red wiggler worms, which is a type of earthworms. 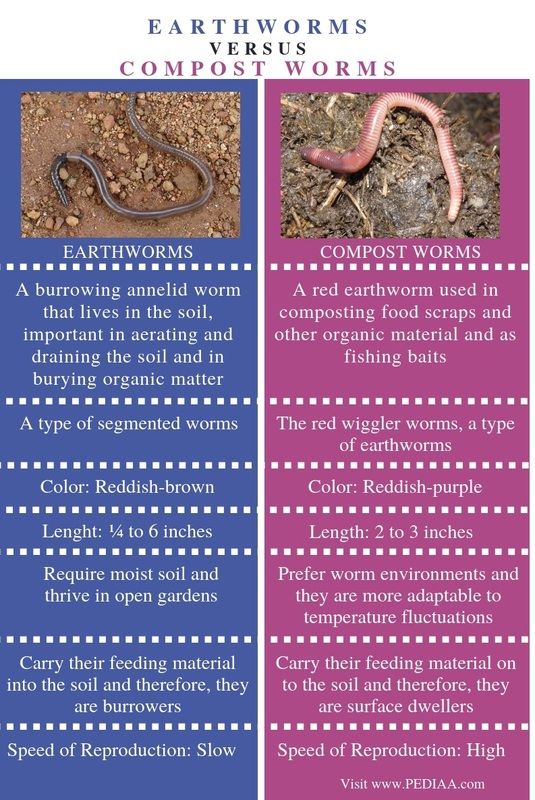 Moreover, the color of an earthworm can be reddish-brown while the color of a compost worm can be reddish-purple. Hence, this is a visually identifiable difference between earthworms and compost worms. Typically, an earthworm is ¼ to 6 inches long while a compost worm is 2 to 3 inches long. Furthermore, their habitat is another difference between earthworms and compost worms. The former requires moist soil and thrive in open gardens while the latter prefers warm environments and they are more adaptable to temperature fluctuations. Also, earthworms carry their feeding material into the soil and therefore they are burrowers while compost worms carry their feeding material on to the soil and therefore, they are surface dwellers. Besides, the speed of reproduction of an earthworm is slower than that of a compost worm. Earthworms are a type of segmented annelids that live in the soil. They are reddish-brown in color and can grow up to 6 inches in length. They are also responsible for increasing the soil quality by increasing the aeration and draining as they are burrowers. On the other hand, red wiggler worms are used as compost worms as they are surface dwellers with a higher rate of reproduction. Red wiggler worms are also a type of earthworms that are reddish-purple in color. Typically, they are shorter than earthworms. Therefore, the main difference between earthworms and compost worms is their appearance and feeding habits. 1. Heidi. “Red Wigglers vs Earthworms in Compost.” Pint Size Farm, 27 Mar. 2015, Available Here.